Yesterday was the longest day of the year. Yes, they are all 24 hours, but the longest day refers to the day with most sunlight. Yesterday and today too, the official sunrise is 6:10am, sunset is 6:46pm. Total sunlight is officially 12 hours 35 minutes and 23 seconds here in Phuket on the longest day of 2009. There's not a massive change year round. The shortest day is December 21st - we'll get only 11 hours 39 minutes and 37 seconds of sunlight. Lots of sunlight year round. Even in this, the fabled "Monsoon" season. Yep, the good weather continues and we made the most of the longest day yesterday. It was hot all weekend. Almost windless on Saturday evening, very warm and humid. Clear skies with bright stars last night. 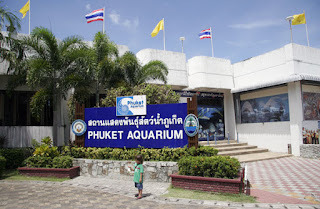 On Sunday, the longest day, we visited Phuket Aquarium for the nth time. Even after many visits I am not bored, because the kids always love it, always ask questions, always learn something. From there we at a light lunch at a little roadside restaurant not far from the aquarium, lovely views over Chalong Bay. 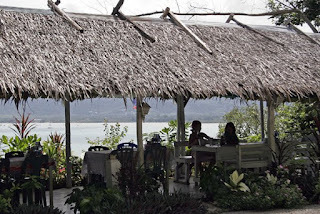 Along the same road is one of our favourite little restaurants but it closes up for low season. There was still time for a walk at Bang Wad Reservoir and a swim at a local pool. Ah, these long summer evenings! June is supposed to be, on average, one of the wettest months in Phuket, but this year it's all different. So, either we get a wet July instead, or we have water shortages, or the whole world is just using way too much aircon.